It’s important not just to say the Promise, but to know what it means. When you say “I promise,” it means you will do your best to keep your word. It is very important to keep your promises and to stand by the things you say. This shows people that they can trust you and rely on you. Giving your best effort is right and honest. Always remember that your best is not the same as someone else’s best. Doing the best you can is more important than trying to be better than someone else. Doing what is right and not doing things we know are wrong is one way to do our duty to God. Another way is to practice our religion at home and at our place of worship. We should respect other people’s religious beliefs even if they are different from our own. Duty to country starts with being a good citizen. This means caring about the people in your community and helping people. Good citizenship also means obeying the law. It means standing up for the rights of all Americans. Good citizens also take care of America’s land, water, and natural places. Helping other people means doing things to help those around you—your family, friends, classmates, neighbors, and others in your community—without having to be told. Besides obeying the Law of the Pack (below), you should obey the laws in your community and state, the rules in your school, the rules at home, and the code of conduct in your den. Just as the parts of the Cub Scout Promise have a meaning, each part of the Law of the Pack has a meaning. 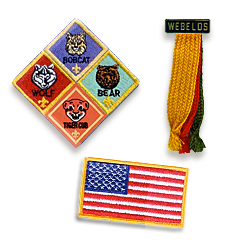 Akela means “good leader.” To a Cub Scout, Akela may be a parent, a teacher, a religious leader, a Cub Scout leader, or another guide. A Cub Scout should choose a good leader to follow. Your pack needs you to be a good member. A good member goes to all meetings, follows the leaders, and pitches in to make the pack better. Being a good member of the pack means doing your share, and sometimes a little more, to help the pack. 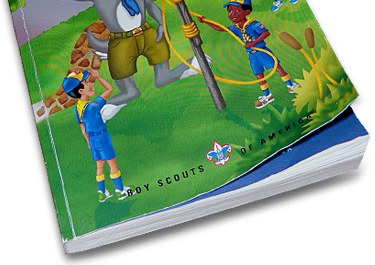 With the leaders and Cub Scouts all working together, the pack helps you grow into a better person. You will learn new things and new skills. You’ll learn the right way to do the right things. And along the way, you will help others. Doing good things for others doesn’t just make them happy. It also gives them the desire (or the “will”) to do good things for others in turn. In this way, the good things you do for others make ripples that pass the goodwill from person to person. The spirit of helpfulness and good cheer spreads from you to others in your neighborhood.